Buoyed by their "popular" television show - the 2 Coreys. 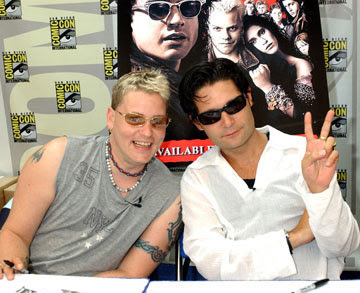 Corey Feldman and Jamison Newlander - are returning for the next "Lost Boys" adventure...and so is Corey Haim. Kiefer Sutherland, the one from the movie with a career, is taking a pass. Angus Sutherland - his half-brother - is on-board for the new movie. # posted by Shaky @ 9:31 p.m. I agree, less Huhn is always good. # posted by Phoff : 11:26 p.m.
Know what really grinds my gears? Too much Huhn. # posted by Rob Huck : 10:33 a.m. If you look close, Haim sort of / kind of looks like Demkiw. # posted by Shaky : 9:29 p.m.
Look even closer, and you realize that Feldman is actually Shaky. # posted by Rob : 11:01 a.m.
# posted by Anonymous : 3:43 p.m.